Yersinia pseudotuberculosis is a Gram-negative bacterium that causes Far East scarlet-like fever in humans, who occasionally get infected zoonotically, most often through the food-borne route. 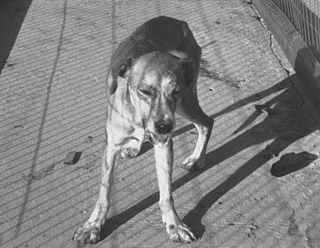 Animals are also infected by Y. pseudotuberculosis. The bacterium is urease positive. In animals, Y. pseudotuberculosis can cause tuberculosis-like symptoms, including localized tissue necrosis and granulomas in the spleen, liver, and lymph nodes. In humans, symptoms of Far East scarlet-like fever are similar to those of infection with Yersinia enterocolitica (fever and right-sided abdominal pain), except that the diarrheal component is often absent, which sometimes makes the resulting condition difficult to diagnose. Y. pseudotuberculosis infections can mimic appendicitis, especially in children and younger adults, and, in rare cases, the disease may cause skin complaints (erythema nodosum), joint stiffness and pain (reactive arthritis), or spread of bacteria to the blood (bacteremia). Far East scarlet-like fever usually becomes apparent five to 10 days after exposure and typically lasts one to three weeks without treatment. In complex cases or those involving immunocompromised patients, antibiotics may be necessary for resolution; ampicillin, aminoglycosides, tetracycline, chloramphenicol, or a cephalosporin may all be effective. To facilitate attachment, invasion, and colonization of its host, this bacterium possesses many virulence factors. Superantigens, bacterial adhesions, and the actions of Yops (which are bacterial proteins once thought to be "Yersinia outer membrane proteins") that are encoded on the "[plasmid] for Yersinia virulence" – commonly known as the pYV – cause host pathogenesis and allow the bacteria to live parasitically. The 70-kb pYV is critical to Yersinia's pathogenicity, since it contains many genes known to encode virulence factors and its loss gives avirulence of all Yersinia species. A 26-kb "core region" in the pYV contains the ysc genes, which regulate the expression and secretion of Yops. Many Ysc proteins also amalgamate to form a type-III secretory apparatus, which secretes many Yops into the host cell cytoplasm with the assistance of the "translocation apparatus", constructed of YopB and YopD. The core region also includes yopN, yopB, yopD, tyeA, lcrG, and lcrV, which also regulate Yops gene expression and help to translocate secretory Yops to the target cell. For example, YopN and TyeA are positioned as a plug on the apparatus so only their conformational change, induced by their interaction with certain host cell membrane proteins, will cause the unblocking of the secretory pathway. Secretion is regulated in this fashion so that proteins are not expelled into the extracellular matrix and elicit an immune response. Since this pathway gives secretion selectivity, it is a virulence factor. Yersinia pseudotuberculosis-derived mitogens (YpM) are superantigens, which are able to excessively activate T cells by binding to the T cell receptor. Since YpM can activate large numbers of the T cell population, this leads the release of inflammatory cytokines. Some highly homologous variants of YPM have been characterized, including YPMa, YPMb, and YPMc. Superantigens (SAgs) are a class of antigens that cause non-specific activation of T-cells resulting in polyclonal T cell activation and massive cytokine release. SAgs are produced by some pathogenic viruses and bacteria most likely as a defense mechanism against the immune system. Compared to a normal antigen-induced T-cell response where 0.0001-0.001% of the body’s T-cells are activated, these SAgs are capable of activating up to 20% of the body’s T-cells. Furthermore, Anti-CD3 and Anti-CD28 Antibodies (CD28-SuperMAB) have also shown to be highly potent superantigens. Ribosomal protein S6 kinase alpha-1 is an enzyme that in humans is encoded by the RPS6KA1 gene. Virulence-related outer membrane proteins are expressed in Gram-negative bacteria and are essential to bacterial survival within macrophages and for eukaryotic cell invasion. MAP kinase-interacting serine/threonine-protein kinase 1 is an enzyme that in humans is encoded by the MKNK1 gene. Erythrogenic toxins, also referred to as streptococcal pyrogenic exotoxins, are secreted by strains of the bacterium Streptococcus pyogenes. SpeA and SpeC are superantigens, which induce inflammation by nonspecifically activating T cells and stimulating the production of inflammatory cytokines. SpeB, the most abundant streptococcal extracellular protein, is a cysteine protease. Pyrogenic exotoxins are implicated as the causative agent of scarlet fever and streptococcal toxic shock syndrome. There is no consensus on the exact number of pyrogenic exotoxins. Serotypes A-C are the most extensively studied and recognized by all sources, but others note up to thirteen distinct types, categorizing SpeF-M as additional superantigens. In molecular biology, the haemolysin expression modulating protein family is a family of proteins. This family consists of haemolysin expression modulating protein (Hha) from Escherichia coli and its enterobacterial homologues, such as YmoA from Yersinia enterocolitica, and RmoA encoded on the R100 plasmid. These proteins act as modulators of bacterial gene expression. Members of this family act in conjunction with members of the H-NS family, participating in the thermoregulation of different virulence factors and in plasmid transfer. Hha, along with the chromatin-associated protein H-NS, is involved in the regulation of expression of the toxin alpha-haemolysin in response to osmolarity and temperature. YmoA modulates the expression of various virulence factors, such as Yop proteins and YadA adhesin, in response to temperature. RmoA is a plasmid R100 modulator involved in plasmid transfer. The HHA family of proteins display striking similarity to the oligomerisation domain of the H-NS proteins. RNA thermometers regulate gene expression in response to temperature allowing pathogens like Yersinia to switch on silent genes after entering the host organism. Usually, RNA thermometers are located in the 5'UTR, but an intergenic RNA thermometer was found in Yersinia pseudotuberculosis. The LcrFRNA thermometer together with the termo-labile YmoA protein activates synthesis of the most crucial virulence activator LcrF (VirF). The RNA thermosensor sequence is 100% identical in all human pathogenic Yersinia species. ↑ Jani, Asim (2003). "Pseudotuberculosis (Yersina)" . Retrieved 2006-03-04. 1 2 Carnoy, C.; Lemaitre, N.; Simonet, M. (2005). "The superantigenic toxin of Yersinia pseudotuberculosis". In Ladant, Daniel; Alouf, Joseph E.; Popoff, Michel R. The Comprehensive Sourcebook of Bacterial Protein Toxins. Academic Press. pp. 862–871. ISBN 978-0-08-045698-0. 1 2 3 4 5 6 7 Robins-Browne, R.; Hartland, E. (2003). "Yersinia species". In Miliotis, Marianne D.; Bier, Jeffrey W. International Handbook of Foodborne Pathogens. CRC Press. pp. 323–355. ISBN 978-0-203-91206-5. 1 2 3 4 5 6 7 Lindler, L. (2004). "Virulence plasmids of Yersinia: characteristics and comparison". In Funnell, B.E. ; Phillips, G.J. Plasmid biology. ASM Press. pp. 423–437. ISBN 978-1555812652. 1 2 Brubaker RR (1983). "The Vwa+ virulence factor of yersiniae: the molecular basis of the attendant nutritional requirement for Ca++". Rev. Infect. Dis. 5 (Suppl 4): S748–58. doi:10.1093/clinids/5.supplement_4.s748. PMID 6195719. ↑ Achtman, M.; Zurth, K.; Morelli, G.; Torrea, G.; Guiyoule, A.; Carniel, E. (23 November 1999). 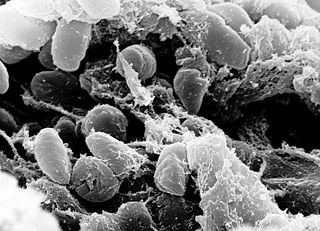 "Yersinia pestis, the cause of plague, is a recently emerged clone of Yersinia pseudotuberculosis". Proc. Natl. Acad. Sci. U.S.A. 96 (24): 14043–8. doi:10.1073/pnas.96.24.14043. PMC 24187 . PMID 10570195. ↑ Rasmussen, Simon; Allentoft, Morten Erik; Nielsen, Kasper; Orlando, Ludovic; Sikora, Martin; Sjögren, Karl-Göran; Pedersen, Anders Gorm; Schubert, Mikkel; Van Dam, Alex; Kapel, Christian Moliin Outzen; Nielsen, Henrik Bjørn; Brunak, Søren; Avetisyan, Pavel; Epimakhov, Andrey; Khalyapin, Mikhail Viktorovich; Gnuni, Artak; Kriiska, Aivar; Lasak, Irena; Metspalu, Mait; Moiseyev, Vyacheslav; Gromov, Andrei; Pokutta, Dalia; Saag, Lehti; Varul, Liivi; Yepiskoposyan, Levon; Sicheritz-Pontén, Thomas; Foley, Robert A.; Lahr, Marta Mirazón; Nielsen, Rasmus; et al. (2015). "Early Divergent Strains of Yersinia pestis in Eurasia 5,000 Years Ago". Cell. 163 (3): 571–582. doi:10.1016/j.cell.2015.10.009. PMC 4644222 . PMID 26496604. ↑ Iriarte M, Cornelis GR (1999). "Identification of SycN, YscX, and YscY, three new elements of the Yersinia yop virulon". J. Bacteriol. 181 (2): 675–80. PMC 93427 . PMID 9882687. 1 2 3 Cornelis GR, Boland A, Boyd AP, Geuijen C, Iriarte M, Neyt C, Sory MP, Stainier I (1998). "The virulence plasmid of Yersinia, an antihost genome". Microbiol. Mol. Biol. Rev. 62 (4): 1315–52. PMC 98948 . PMID 9841674. 1 2 3 4 5 6 7 Lee VT, Tam C, Schneewind O (2000). "LcrV, a substrate for Yersinia enterocolitica type III secretion, is required for toxin targeting into the cytosol of HeLa cells". J. Biol. Chem. 275 (47): 36869–75. doi:10.1074/jbc.M002467200. PMID 10930402. ↑ Zumbihl R, Aepfelbacher M, Andor A, Jacobi CA, Ruckdeschel K, Rouot B, Heesemann J (1999). "The cytotoxin YopT of Yersinia enterocolitica induces modification and cellular redistribution of the small GTP-binding protein RhoA". J. Biol. Chem. 274 (41): 29289–93. doi:10.1074/jbc.274.41.29289. PMID 10506187. ↑ Persson C, Carballeira N, Wolf-Watz H, Fällman M (1997). "The PTPase YopH inhibits uptake of Yersinia, tyrosine phosphorylation of p130Cas and FAK, and the associated accumulation of these proteins in peripheral focal adhesions". EMBO J. 16 (9): 2307–18. doi:10.1093/emboj/16.9.2307. PMC 1169832 . PMID 9171345. ↑ Håkansson S, Galyov EE, Rosqvist R, Wolf-Watz H (1996). "The Yersinia YpkA Ser/Thr kinase is translocated and subsequently targeted to the inner surface of the HeLa cell plasma membrane". Mol. Microbiol. 20 (3): 593–603. doi:10.1046/j.1365-2958.1996.5251051.x. PMID 8736538. ↑ Ruckdeschel K, Machold J, Roggenkamp A, Schubert S, Pierre J, Zumbihl R, Liautard JP, Heesemann J, Rouot B (1997). "Yersinia enterocolitica promotes deactivation of macrophage mitogen-activated protein kinases extracellular signal-regulated kinase-1/2, p38, and c-Jun NH2-terminal kinase. Correlation with its inhibitory effect on tumor necrosis factor-alpha production". J. Biol. Chem. 272 (25): 15920–7. doi:10.1074/jbc.272.25.15920. PMID 9188492. ↑ Alrutz MA, Isberg RR (1998). "Involvement of focal adhesion kinase in invasin-mediated uptake". Proc. Natl. Acad. Sci. U.S.A. 95 (23): 13658–63. doi:10.1073/pnas.95.23.13658. PMC 24875 . PMID 9811856. ↑ Galyov EE, Håkansson S, Forsberg A, Wolf-Watz H (1993). "A secreted protein kinase of Yersinia pseudotuberculosis is an indispensable virulence determinant". Nature. 361 (6414): 730–2. doi:10.1038/361730a0. PMID 8441468. ↑ Boland A, Cornelis GR (1998). "Role of YopP in suppression of tumor necrosis factor alpha release by macrophages during Yersinia infection". Infect. Immun. 66 (5): 1878–84. PMC 108138 . PMID 9573064. ↑ Skurnik M, el Tahir Y, Saarinen M, Jalkanen S, Toivanen P (1994). "YadA mediates specific binding of enteropathogenic Yersinia enterocolitica to human intestinal submucosa". Infect. Immun. 62 (4): 1252–61. PMC 186266 . PMID 8132332. ↑ China B, Sory MP, N'Guyen BT, De Bruyere M, Cornelis GR (1993). "Role of the YadA protein in prevention of opsonization of Yersinia enterocolitica by C3b molecules". Infect. Immun. 61 (8): 3129–36. PMC 280979 . PMID 8335343. ↑ China B, N'Guyen BT, de Bruyere M, Cornelis GR (1994). "Role of YadA in resistance of Yersinia enterocolitica to phagocytosis by human polymorphonuclear leukocytes". Infect. Immun. 62 (4): 1275–81. PMC 186269 . PMID 8132334. ↑ Han YW, Miller VL (1997). "Reevaluation of the virulence phenotype of the inv yadA double mutants of Yersinia pseudotuberculosis". Infect. Immun. 65 (1): 327–30. PMC 174597 . PMID 8975933. ↑ Cornelis GR, Sluiters C, Delor I, Geib D, Kaniga K, Lambert de Rouvroit C, Sory MP, Vanooteghem JC, Michiels T (1991). "ymoA, a Yersinia enterocolitica chromosomal gene modulating the expression of virulence functions". Mol. Microbiol. 5 (5): 1023–34. doi:10.1111/j.1365-2958.1991.tb01875.x. PMID 1956283. ↑ Isberg RR, Van Nhieu GT (1994). "Two mammalian cell internalization strategies used by pathogenic bacteria". Annu. Rev. Genet. 28: 395–422. doi:10.1146/annurev.ge.28.120194.002143. PMID 7893133. 1 2 Miller, V. (1992). "Yersinia invasion genes and their products". ASM News. 58: 26–33. ↑ Bliska JB, Falkow S (1992). "Bacterial resistance to complement killing mediated by the Ail protein of Yersinia enterocolitica". Proc. Natl. Acad. Sci. U.S.A. 89 (8): 3561–5. doi:10.1073/pnas.89.8.3561. PMC 48908 . PMID 1565652. ↑ Lindler LE, Tall BD (1993). "Yersinia pestis pH 6 antigen forms fimbriae and is induced by intracellular association with macrophages". Mol. Microbiol. 8 (2): 311–24. doi:10.1111/j.1365-2958.1993.tb01575.x. PMID 8100346. ↑ Miyoshi-Akiyama T, Fujimaki W, Yan XJ, Yagi J, Imanishi K, Kato H, Tomonari K, Uchiyama T (1997). "Identification of murine T cells reactive with the bacterial superantigen Yersinia pseudotuberculosis-derived mitogen (YPM) and factors involved in YPM-induced toxicity in mice". Microbiol. Immunol. 41 (4): 345–52. doi:10.1111/j.1348-0421.1997.tb01211.x. PMID 9159409. 1 2 Uchiyama T, Miyoshi-Akiyama T, Kato H, Fujimaki W, Imanishi K, Yan XJ (1993). "Superantigenic properties of a novel mitogenic substance produced by Yersinia pseudotuberculosis isolated from patients manifesting acute and systemic symptoms". J. Immunol. 151 (8): 4407–13. PMID 8409410. ↑ Carnoy C, Loiez C, Faveeuw C, Grangette C, Desreumaux P, Simonet M (2003). Impact of the Yersinia pseudotuberculosis-derived mitogen (YPM) on the murine immune system. Adv. Exp. Med. Biol. Advances in Experimental Medicine and Biology. 529. pp. 133–5. doi:10.1007/0-306-48416-1_26. ISBN 978-0-306-47759-1. PMID 12756744. ↑ Yoshino K, Ramamurthy T, Nair GB, Fukushima H, Ohtomo Y, Takeda N, Kaneko S, Takeda T (1995). "Geographical heterogeneity between Far East and Europe in prevalence of ypm gene encoding the novel superantigen among Yersinia pseudotuberculosis strains". J. Clin. Microbiol. 33 (12): 3356–8. PMC 228710 . PMID 8586739. ↑ Fukushima H, Matsuda Y, Seki R, Tsubokura M, Takeda N, Shubin FN, Paik IK, Zheng XB (2001). "Geographical heterogeneity between Far Eastern and Western countries in prevalence of the virulence plasmid, the superantigen Yersinia pseudotuberculosis-derived mitogen, and the high-pathogenicity island among Yersinia pseudotuberculosis strains". J. Clin. Microbiol. 39 (10): 3541–7. doi:10.1128/JCM.39.10.3541-3547.2001. PMC 88386 . PMID 11574570. ↑ Nikolova S, Najdenski H, Wesselinova D, Vesselinova A, Kazatchca D, Neikov P (1997). "Immunological and electronmicroscopic studies in pigs infected with Yersinia enterocolitica 0:3". Zentralbl. Bakteriol. 286 (4): 503–10. doi:10.1016/s0934-8840(97)80053-9. PMID 9440199. ↑ Smith MG (1992). "Destruction of bacteria on fresh meat by hot water". Epidemiol. Infect. 109 (3): 491–6. doi:10.1017/s0950268800050482. PMC 2271933 . PMID 1468533. ↑ Donadini R, Liew CW, Kwan AH, Mackay JP, Fields BA (January 2004). "Crystal and solution structures of a superantigen from Yersinia pseudotuberculosis reveal a jelly-roll fold". Structure. 12 (1): 145–56. doi:10.1016/j.str.2003.12.002. PMID 14725774. ↑ Koo, Jovanka T.; Alleyne, Trevis M.; Schiano, Chelsea A.; Jafari, Nadereh; Lathem, Wyndham W. (2011-09-13). "Global discovery of small RNAs in Yersinia pseudotuberculosis identifies Yersinia-specific small, noncoding RNAs required for virulence". Proceedings of the National Academy of Sciences of the United States of America. 108 (37): E709–717. doi:10.1073/pnas.1101655108. ISSN 1091-6490. PMC 3174644 . PMID 21876162. ↑ Shepherd, Douglas P.; Li, Nan; Micheva-Viteva, Sofiya N.; Munsky, Brian; Hong-Geller, Elizabeth; Werner, James H. (2013-05-21). "Counting small RNA in pathogenic bacteria". Analytical Chemistry. 85 (10): 4938–4943. doi:10.1021/ac303792p. ISSN 1520-6882. PMID 23577771. ↑ Nuss, Aaron M.; Heroven, Ann Kathrin; Waldmann, Barbara; Reinkensmeier, Jan; Jarek, Michael; Beckstette, Michael; Dersch, Petra (2015-03-01). "Transcriptomic profiling of Yersinia pseudotuberculosis reveals reprogramming of the Crp regulon by temperature and uncovers Crp as a master regulator of small RNAs". PLoS Genetics. 11 (3): e1005087. doi:10.1371/journal.pgen.1005087. ISSN 1553-7404. PMC 4376681 . PMID 25816203. ↑ Righetti, Francesco; Nuss, Aaron M.; Twittenhoff, Christian; Beele, Sascha; Urban, Kristina; Will, Sebastian; Bernhart, Stephan H.; Stadler, Peter F.; Dersch, Petra (2016-06-28). "Temperature-responsive in vitro RNA structurome of Yersinia pseudotuberculosis". Proceedings of the National Academy of Sciences of the United States of America. 113 (26): 7237–7242. doi:10.1073/pnas.1523004113. ISSN 1091-6490. PMC 4932938 . PMID 27298343.